This term has been our biggest yet, we now have 56 members signed up already, all of which I can amazingly say are constantly at training and active within the club. Last year our total was 41 by the end of the year! Training itself is extremely promising, we have a solid black belt group now and the colour belts are continuously improving and stronger than most I’ve seen over the years, this in take has been huge, we have a very strong squad. Our average sessions on a Tuesday’s are 42 people training and Thursdays 36 people (The Thursday union studio is pretty cramped now!). We hosted the first of our special seminar series this year on November 19th with Master Gary Bradshaw 7th Degree Black Belt. We had 50 members join us for it, making it our biggest seminar ever. Master Bradshaw is extremely high up and to get him to do one for a uni club is a rarity, we learnt loads in that 3 hours, and training was tough! haha. Fight Night ‘2’ was an incredible success, 12 of the club competed against each other and put their bodies on the line, literally! The demo team did an amazing job too. We had a head count of 381 people in the union audience watching the event and managed to raise £2087 altogether! 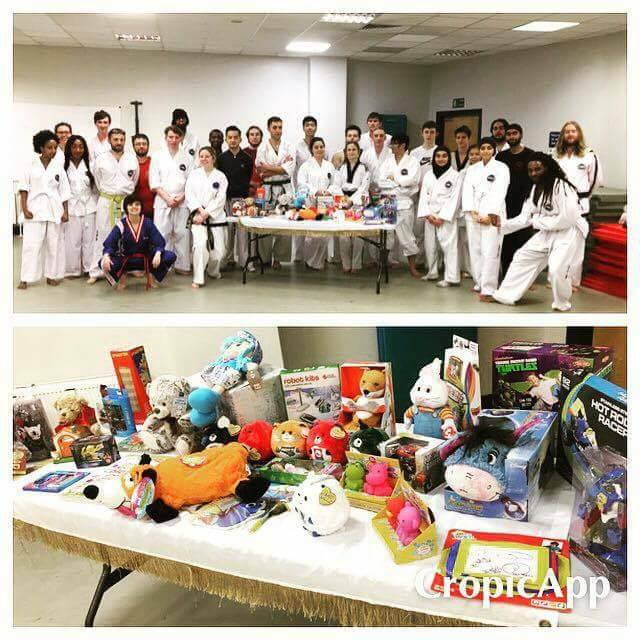 On Tuesday 13th December we did our annual toy appeal for local Manchester Charity Wood Street Mission where the club members purchased toys to donate, they brought in an amazing amount of toys for the cause. Not just lean mean fighting machines! The club members took part in their gradings over this term (belt examinations) which once again we had 100% pass rate which is incredible. 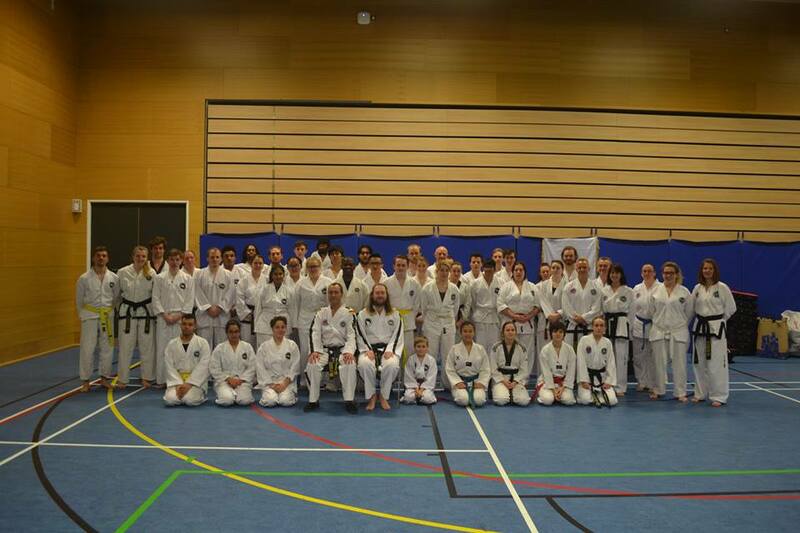 All are taking externally by a panel and since I started the club up in 2011 we have had over 250 gradings take place, all with 100% pass rate. Everyone puts in so much effort and it shows in their training and commitment. We have totaled 232 hours of volunteering from the committee this year, everyone has been very active. The club have had a few special recognition this term, in late September I was awarded the Distinguished Instructor Award by the International Taekwondo Council, we have had 16 letters from senior figures in Taekwondo sending their support and thanks for all that we are doing as a club and we got a phone call yesterday from Taekwondo Olympian Lutalo Muhammad congratulating us on all our efforts so far (Thanks Adam !). Term 2 and 2017 will be spent competing in the British University Taekwondo League, where we hope to be crowned Champions for a 2nd time in two years. I have arranged for 5x World Champion, 6x European and Taekwondo Hall of Famer Mr Roger Lawrence to conduct a Seminar for us to help with our preparation for the league and 4x World Champion Master Auicello to conduct one to help our World Championship preparation. We will have more gradings and training will also be aiming towards being the first ever University club to compete at the World Championships, held in Holland in 2017. I have managed to get via the British University Taekwondo League a complete set of ring jigsaw mats for the club, giving them to us for free! This will encourage us to continue to host a league match day and is amazing as they cost around £1300! It will make our training so much better and allow us to compete at the highest level. This is something we can chat about in the new year because we would need to store them somewhere if we got them. Thank you for all the continued support, I hope everyone has a great holiday break and happy new year! Next So why join a gym?